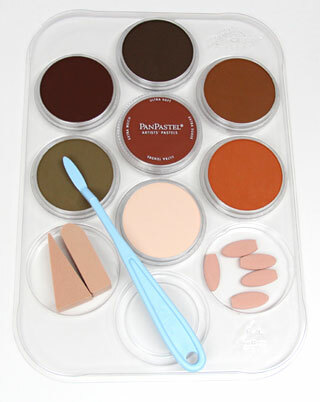 PanPastel Colors are professional quality ultra-fine pastel colors in a unique pan (cake-like) format. The special qualities of PanPatel means that they can be mixed, layered and applied "dry" making them ideal for applying realistic weathering effects quickly. UNIQUE QUALITIES OF PANPASTEL COLORS: (1) INSTANT: no preparation or drying time required (2) MIXABLE: mix colors for an infinite number of custom colors (3) LOW DUST: "no mess" alternative to powders and pastel sticks (4) COMPATIBLE: with spray fixatives and other flat finishes (5) ERASABLE: erase or clean off the color to change it (prior to fixing) and (6) REALISTIC EFFECTS - do not have a "painted on" appearance when applied. Basic Instructions and Tips Included!